When you’re running a construction business, promoting your services and finding clients can be time-consuming. Since more and more people are researching companies online, you need a strong digital presence if you want to make it in this competitive market. And building a solid website is the first step towards ensuring potential clients come your way. Luckily, WordPress makes it easier than ever to put together a professional website, especially when you choose a theme that pretty much does all the heavy lifting for you. 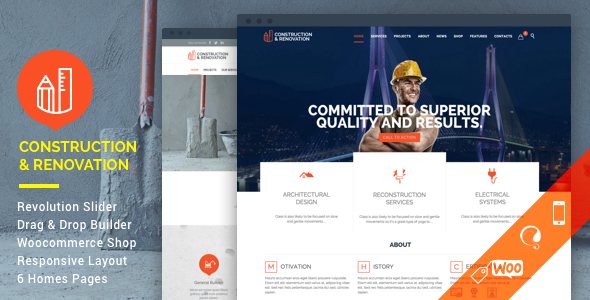 In order to save you some time and a lot of headaches, we’ve gathered the best construction WordPress themes on the market below. All you need to do is browse through our list and pick your favorite. 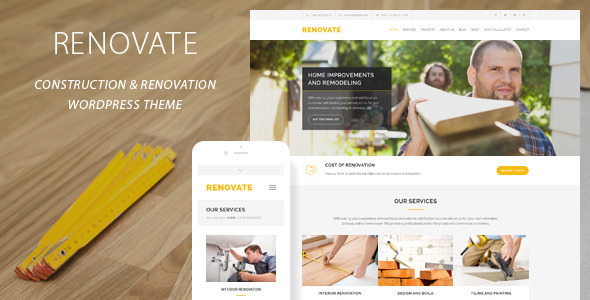 Renovate is well-suited for most businesses that operate under the construction specter, including remodeling companies, handymen, electricians, plumbers, painters, and so on. What’s great about it is that comes with a Cost Calculator Tool – a quick and easy way to get cost estimates for any type of construction work. It also includes the Visual Composer and Slider Revolution premium plugins, as well as premium font icons. Moreover, it packs 12 page templates, sticky menus, touch friendly sliders and carousels, ajax contact forms, and more awesome features. Construction comes packed with the Visual Composer drag and drop page builder, so you won’t need any programming knowledge to set up beautiful page designs. It’s also very user-friendly and easy to customize. You can tweak it without touching a line of code. The theme bundles the Slider Revolution and Essential Grid premium plugins, providing great value. It’s responsive, translation-ready, and the team behind it provides great support. In other words, you’ll be in great hands if you go with this one. No list featuring the best construction WordPress themes available would be complete without this one. 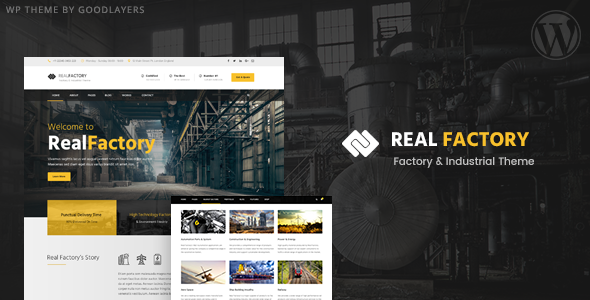 Real Factory comes with a neat page builder that’s insanely easy to use. The theme also sports a professional and modern design, making sure you’ll make a long-lasting impression on potential clients. Its powerful admin panel is very user-friendly and the theme is fully integrated with WooCommerce. You’ll be able to easily make tweaks via the Live Customizer. Furthermore, Real Factory also bundles Revolution Slider, so you’ll save some cash. That’s a good deal in our book. Its powerful admin panel really makes Constructo stand out from the crowd. You can customize every part of your website to make sure it suits your preferences; all without breaking a sweat. Visual Composer and Revolution Slider are included. The theme also works well with WooCommerce. It’s slick, fast, and flexible. If you were looking for an intuitive, flexible, and powerful WordPress theme, look no more. Cast will make your content pop with its pre-made layouts, so setting up your site will be a breeze. The theme includes the most popular premium plugins on the market: Visual Composer, Revolution Slider, and Essential Grid. The design is also top-notch, its parallax effect being a thing of beauty. 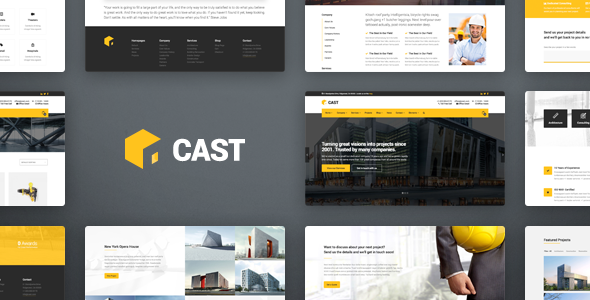 In short, Cast offers a complete solution for anyone looking to build a memorable construction website. It’s not a typo – these first two entries on our list share a name, which is pretty common since they serve basically the same purposes. This one comes with a posh and elegant design, while also packing some advanced features that will help you put your best foot forward in the digital world. It offers endless layout possibilities and has a few pre-build sections that might come in handy. The list includes Opening Hours, Free Consultation / Appointment Form, Q&A, team member pages, and so on. It also sports a drag and drop page builder and bundles the Revolution Slider premium plugin. Last but not least, it comes with several HD video tutorials that will guide you through the process of getting your site online. One of the best construction WordPress themes for sure. Bibllio is a versatile WordPress theme that can easily be customized to fit your company’s purposes. It comes with niche pre-made pages like company presentation, annual report, and recruitment. It’s compatible with WooCommerce, easy to use, and translation ready. The theme also offers limitless customization and advanced blog options. Three premium plugins are included, providing great value: Visual Composer, Essential Grids, and Slider Revolution. BuildPress grabbed our attention thanks to its awesome features. The theme packs an intuitive page builder, a real-time WP customizer, and several page layouts to choose from. The Essential Grid gallery plugin is included with BuildPress, while the theme also works well with most popular plugins out there. It’s translation ready, WooCommerce integrated, and easy to use. You’ll have your website online in no time. 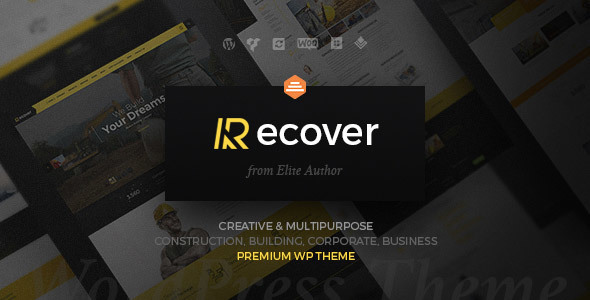 Recover boasts an edgy and stunning design, as well as a suite of useful features you might want to get your hands on. The theme comes pre-packed with a drag and drop page builder to ensure you can easily design your website just how you like it. It bundles the Slider Revolution plugin and the theme’s advanced options allow you to customize it to the max. For instance, you have 90+ header and footer options to choose from. There’s no doubt you will be able to perfectly match your site to your brand without any outside help. 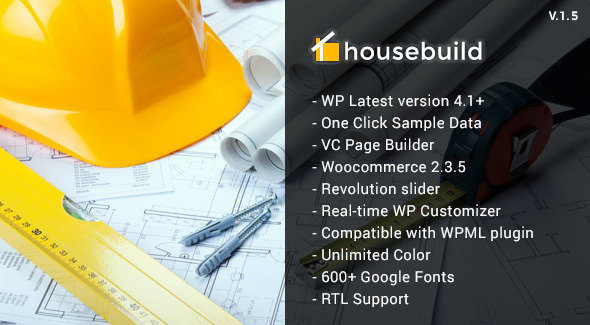 Rounding up our list of the best construction WordPress themes available, Housebuild has a lot going for itself. Besides being optimized and user-friendly, the theme offers a clean and fresh design, helping you make a great first impression in the digital world. Visual Composer and Revolution Slider are included. Not too shabby. 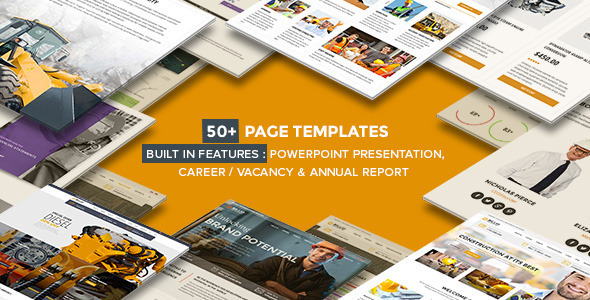 Indus comes pre-packed with several construction-related pages you might need – like projects, services, annual reports, corporate presentation, etc. It also includes a Career Application form in case you’re looking to expand your team. The theme bundles the Visual Composer plugin to keep things simple and is SEO optimized, to make sure potential customers will find you with ease. WooCommerce integration is also on the list of features, in case you were thinking about opening an online shop. 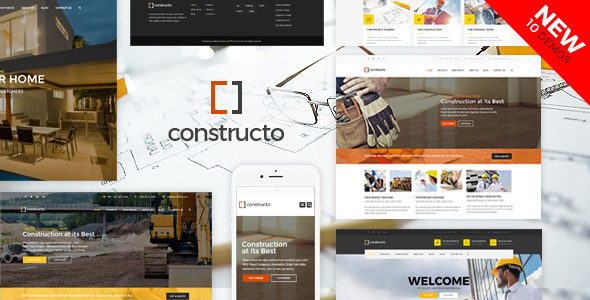 Why Choose One of the Construction WordPress Themes on Our List? Business owners have a lot to deal with. From supervising workers to securing projects, your plate is already pretty full. While having a professional website is mandatory, no one says you need to spend tons of time and resources building your online presence. 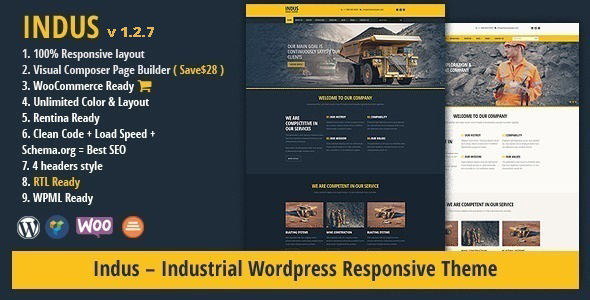 The construction WordPress themes on our list are all very intuitive and easy to use, so you can get your page up and running as fast as possible. Several even come with pre-built page layouts and drag and drop page builders to make things as smooth as possible. There’s no need to hire a team of developers or designers to help you out. You just have to invest in the right theme and spend a couple hours customizing it to best fit your brand. A great website will help your business stand out from the crowd and expand your client base. With minimal investment you can showcase your services in style and make it easier for potential clients to come your way. 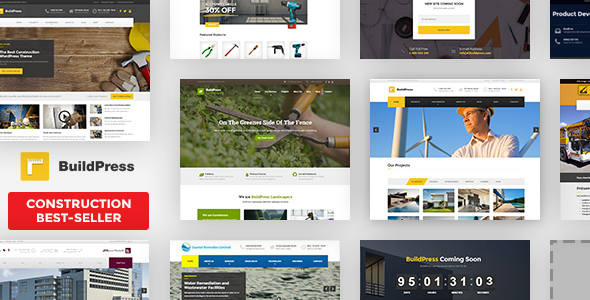 Pick any of the awesome construction WordPress themes on our list and you’re off to a great start. You’ll be reaping the rewards in no time. 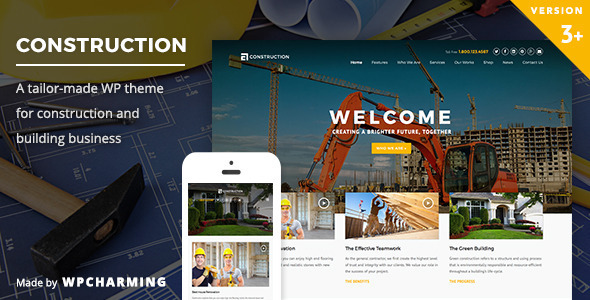 I want to share one more construction based theme which is Real Construction WordPress theme. It has features like fully widgetized home page, different blog page layouts options and many others.